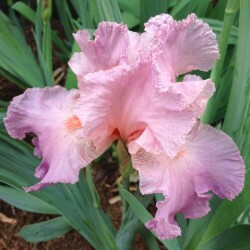 [Zurbrigg, 1985] Tall Bearded Iris with rose-pink self on excellent S-curved stalks. Height 35" (89 cm). 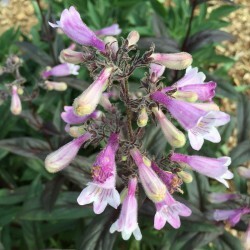 Midseason bloom and rebloom (Oct in VA). Ruffled and laced rose pink, lighter around tangerine pink beard; slight sweet fragrance. 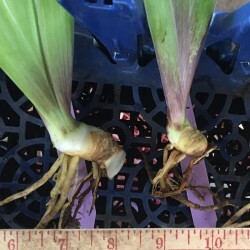 Irises will absolutely not tolerate wet feet (too much water will cause the rhizomes to rot) and require very well-drained soil at all times of the year.